Short Story for Children written by: Stefani. It was a usual day when, suddenly, started to rain. I went inside my house and, suddenly an earthquake started. The house was getting destroyed too fast. A tornado came taking Susie with it. 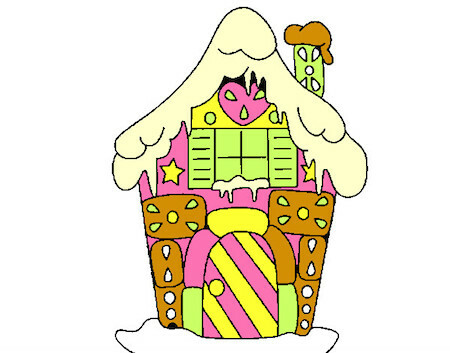 The girl had fallen asleep, but when she woke up, saw a beautiful place made of sweets. Began to eat until was full. Then she continued walking through a road of bonbons. A pretty woman appeared and told her that the road of bonbons was delicious, and the chocolate road was worst. The girl did what she said and continued walking through the bonbons road. She arrived at a candy forest, it looked ugly and did not want to continue. Turned back, but the roads had disappeared, so, took courage and continued walking. After crossing the forest she saw a ginger house, went inside and fell into a cage, tried to bite it to scape, but it was made of metal, suddenly she saw the pretty woman, who had good look, but actually was an awful person. Prepared a really hot candy and gave it to Susie. The pretty woman suddenly became an awful witch, Susie realized that she was a witch that wanted to eat her, but Susie was smarter than the witch and was able to scape and went back home. Moral of the Story: Do not judge by appearances, can be deceptive.